The first gravity survey of the entire Antarctic ice sheet, conducted using data from the NASA/ German Aerospace Center Gravity Recovery and Climate Experiment (Grace), concludes the ice sheet's mass has decreased significantly from 2002 to 2005. Isabella Velicogna and John Wahr from the University of Colorado, demonstrated for the first time that Antarctica's ice sheet lost a significant amount of mass since 2002. The estimated loss was enough to raise global sea level about 1.2 millimeters (0.05 inches) during the survey period, or about 13 percent of the overall sea level rise for the same period. Antarctica's ice sheet decreased by 152 (plus or minus 80) cu.km of ice annually between April 2002 and August 2005. Antarctica's ice loss equals the volume of water the United States consumes in three months (a cubic kilometer is one trillion liters or 264 billion gallons). This represents a change of about 0.4 millimeters (.016 inches) per year to global sea level rise. 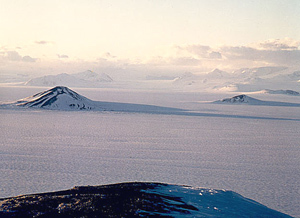 Most of the mass loss came from the West Antarctic ice sheet. 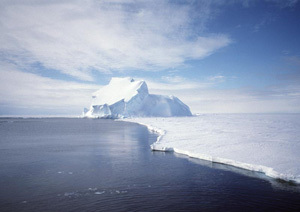 Antarctica is Earth's largest reservoir of fresh water. Because ice sheets are a large source of uncertainties in projections of sea level change, this research represents a very important step toward more accurate prediction, and has important societal and economic impacts. Measuring variations in Antarctica's ice sheet mass is difficult because of its size and complexity, but NASA satellites are able to survey the entire ice sheet, and track the balance between mass changes in the interior and coastal areas. Previous estimates have used various techniques, each with limitations and uncertainties and an inherent inability to monitor the entire ice sheet. Even studies that synthesized results from several techniques, such as the assessment by the Intergovernmental Panel on Climate Change, suffered from a lack of data in critical regions. The Antarctic mass loss findings were enabled by the ability of the identical twin Grace satellites to track minute changes in Earth's gravity field resulting from regional changes in planet mass distribution. Mass movement of ice, air, water and solid earth reflect weather patterns, climate change and even earthquakes. To track these changes, Grace measures micron-scale variations in the 220km (137 mile) separation between the two satellites, which fly in formation. It is predicted that climate change will cause the world's two largest ice sheets that cover Antarctica and Greenland to melt. The world's oceans will subsequently rise 5-6 metres (16-20 feet), flooding low-lying coastal areas, many of which are heavily populated. Image NASA/Ben Holt Sr. In the most comprehensive survey ever undertaken of the massive ice sheets covering Greenland and Antarctica, NASA scientists confirm climate warming is changing how much water remains locked in Earth's largest storehouses of ice and snow. "If the trends continue and climate warming continues as predicted, the polar ice sheets could change dramatically," said lead author Jay Zwally of NASA's Goddard Space Flight Center. "The Greenland ice sheet could be facing an irreversible decline by the end of the century." This new survey is the first to inventory the losses of ice and the addition of new snow on both in a consistent and comprehensive way throughout an entire decade. There was a net loss of ice from the combined polar ice sheets between 1992 and 2002, and a corresponding rise in sea level. The survey documented for the first time extensive thinning of the West Antarctic ice shelves, an increase in snowfall in the interior of Greenland and thinning at the edges. All are signs of a warming climate predicted by computer models. Researchers used nine years of elevation mapping over much of Antarctica and 10.5 years of data over Greenland from the European Remote-sensing Satellites. The survey pinpointed where the ice sheets were thinning and where they were growing. Greenland has large ice losses along the southeastern coast and a large increase in ice thickness at higher elevations in the interior due to relatively high rates of snowfall. There was a slight gain in the total mass of frozen water in the ice sheet over the decade studied, contrary to previous assessments. This situation may have changed in just the past few years. Last month NASA scientists at the Jet Propulsion Laboratory reported a speed up of ice flow into the sea from several Greenland glaciers. "The melting of ice at the edges of the ice sheet is also increasing, which causes the ice to flow faster," Zwally said. "A race is going on in Greenland between these competing forces of snow build-up in the interior and ice loss on the edges. But we don't know how long they will be approximately in balance with each other or if that balance has already tipped in favor of the recently accelerating outflow from glaciers." It is very different in Antarctica, where ice sheets had a major net loss of ice due to outflow from West Antarctica. These losses, which may have been going on for decades, outweighed the gains in snow and ice seen in the East Antarctic ice sheet and parts of West Antarctica. The ice shelves around West Antarctica are also thinning, with rising temperatures. The floating ice shelves are vulnerable to climate change. Some ice shelves in the Antarctic Peninsula have totally disintegrated in recent years, allowing the ice from the land to move into the ocean faster. Overall, the gains and losses of ice from the Greenland and Antarctic sheets, added up to a net loss of ice to the sea. The Greenland ice sheet annually gained approximately 11 billion tons of water, while Antarctica lost about 31 billion tons a year. The 20 billion net tons added to the oceans is equivalent to the amount of fresh water annually used in homes, businesses and farming in New York, New Jersey and Virginia. "The contribution of the ice sheets to sea-level rise during the decade studied was smaller than expected, just 2 percent of the recent increase of nearly 3mm (0.12 inches) a year," Zwally said. "Current estimates of the other major sources of sea-level rise - expansion of the ocean by warming temperatures and runoff from low-latitude glaciers - do not make up the difference, so we have a mystery on our hands as to where the water is coming from."